Place the 15 territories in a circle (leaving small empty spaces between them). Place the Emperor on one of the territories. Empty the bag with the paladin cubes in the middle of the circle of territories. Place the 5 colored clan markers in the middle of the circle of territories. Take 3 cubes of each color from the middle of the circle of territories and place them at random on the territories, 1 per territory. Each player selects a color and takes a set of 10 'O- castles and a set of 5 numbered discs in that color. Each player takes a court board. 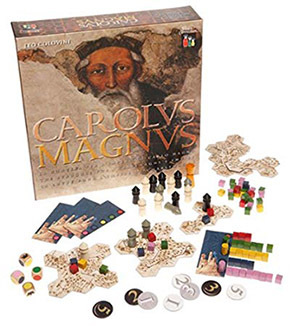 Return equipment not used in the 2 player game to the box: 10 castles, 3 sets of numbered discs, . 2 court boards, and 1 die. Each player throws the 3 dice twice and 1 die once (total 7 dice) to select his initial paladin to reserve (when a crown is thrown, the player chooses one of the 5 colors). The player places the 7 paladin cubes near his court. Place your equipment openly in front of you: reserve of 7 cubes, 10 castles, 5 discs (face up), and 1 court board. Leave space to the right of your court to place paladins during the game. throws the dice to replenish the 3 paladins that he played. Each player, in turn order, chooses one of his numbered discs and plays it face up just inside the circle of territories. The numbers on the two discs must be different. Players choose a starting player for the first round by lot. In subsequent rounds, the starting player is the player who had placed the lower number in the previous round. Players play their discs so they slightly cover the discs they played in previous rounds so all discs may be seen with the latest disc on top (see figure 1). If both players have the same numbered disc when each has just one left, the first player's number is considered the lower one. After every fifth round, each player picks up his 5 discs to use them again in the following opening phases. The numbers on the discs have two purposes: they indicate the order in which the players will play with the lower number playing first, and they indicate up to how far the player moves the Emperor. Example: Albert plays his number 3 disc and Bob his number 2 disc. Bob is first in the action phase and moves the Emperor 1 or 2 spaces during that part of his turn. Albert plays second and moves the Emperor 1, 2, or 3 spaces in that part of his turn. The players take their turns in the action phase in the order chosen in the Opening Phase. First, the player who played the lower numbered disc, and second, the other player. The player plays 3 of the 7 paladins in his reserve to his court or the territories. The 3 may be played as the player chooses. The player may split the paladins as he chooses among his court and the territories. He may play all in his court, all in one or more territories, or any combination that suits him. Paladins that remain in a player's reserve are not in play. Only those played by the players are in the game and, once played, may not be moved. When a player plays paladins to his court, he plays them next to the dots matching the color of the paladin played. A player gains control of a paladin color by having more paladins in his court of that color than his opponent has in his court. If both players have the same number, control remains with the player who had it before. When a player gains control of a color, he takes the matching colored clan marker and puts it on the corresponding color dot of his court. This indicates that he controls all paladins of that color in the territories. When a player plays paladins in territories, he may play one or more in a single territory or play just one in each of one or more territories. A player plays paladins in a territory to strengthen or change control in the territory. 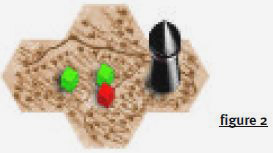 By adding paladins of a color he controls, a player can gain control in a territory and then move the Emperor there to place a castle of his color. Such a move is risky as it is difficult to retain control of a color. The same paladins that enable a player to take a territory may be used later by his opponent to take it away from him. Also, every paladin played by a player in a territory is one less paladin played in his court for control of the color. Thus, players often wait to play paladins in territories until later in that game when adding paladins can be decisive in determining the winner of the game. The player moves the Emperor clockwise around the circle of territories. When moving the Emperor, each territory counts as a step. The player moves the Emperor at least one step, but no more steps than the number on the disc he played in the Opening Phase. The players examine the territory where the Emperor stops to see who controls the territory. The player who controls the region may be able to place a castle there (see details in "Castles and Territories"). Example: In game preparation, the players place one paladin in each of the 15 territories. On Anna's first turn she gains control of red by playing a red paladin at her court. She takes the red clan marker to indicate her control of the red paladins. She then moves the Emperor to a territory with a red paladin and places one of her castles there. Early in the game, placing castles is easy and players often build castles on every turn. Later in the game, this is much more difficult. The player rolls the 3 dice and takes 3 paladins from the center, matching the colors rolled on the dice, to replace the ones he played. When a player rolls a crown, he may select any color paladin. If there are no paladins left of one of the colors in the center, each player returns an equal number of that color from his court to the center. This concludes the player's 3 actions. When both players have taken their turns, a new round begins with another Opening Phase started by the player who played the lower number in the previous turn. To build a castle in a territory, a player must control a majority of the paladins in the territory and the Emperor must stop there. Majorities are obvious at the start, when there is only one paladin in each territory. Later when players try to invade and take over each other's territories, determining control of a region is more difficult. To determine this, each player counts the paladins of the colors he controls. The one who controls the most paladins in a region without a castle, builds a castle. No castle is built in case of a tie. If the Emperor stops in a territory in which the paladins are controlled by neither player, which may happen in the early stages of a game, no castle is built. Possession of a territory may not be permanent. The shift in the control of a paladin color from one player to the other or the placement of new paladins in one of the territories, can change control of the territory. When the Emperor stops in a territory in which there is already one or more castles, players check to see who has the majority and include the castles in the count as if they were paladins of the player whose castles they are. 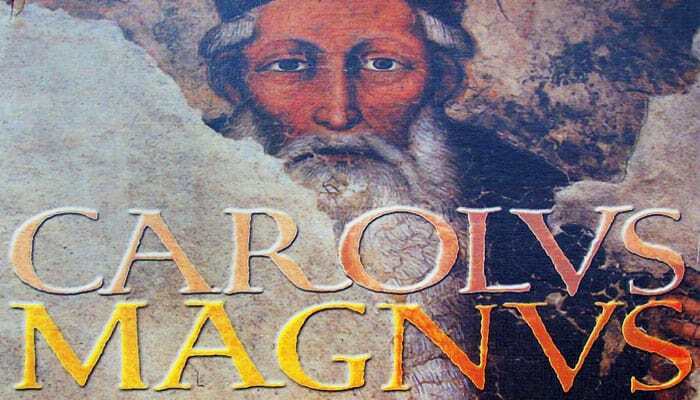 If the majority has not changed or if there is a tie, the territory is unchanged and no castle is built. A player does not add a castle to a region that already has one. If the majority in a territory has changed, all castles are removed and replaced with castles belonging to the player now in the majority in the territory. A common situation for a takeover is shown in figure 2. The black castle indicates that the black player controlled the territory when the Emperor last stopped there. He controlled the 2 green paladins and the white player the red one. If the white player gains control of green in his court, he also gains the majority in the territory: 3 to 1 (the 3 paladins vs. the castle). If the Emperor now stops there, the white player would claim the territory and replace the black castle with a white one. One of the most important features of the game occurs when a player builds castles in adjacent territories. When a player builds a castle in a territory (either a new castle or a takeover) and has castles in one or both of the adjacent territories, the adjacent territories with castles of the same color are merged into one large territory. This larger territory contains all the paladins and castles of the former territories. A newly merged territory is not checked for a change in majority. These merged territories are stronger and more difficult to take over than single territories because all the castles in them are counted as paladins. This also makes them very desirable targets. When a merged territory is taken over, all the castles in the territory are replaced by castles of the player who took over the territory. Once merged, a territory cannot be divided and is regarded from then on as a single territory containing the paladins and castles of the former territories. The merged territory also counts as just one step when moving the Emperor: a move to a merged territory counts as 1 step, just as if it were a single territory. If a player builds a castle in a territory adjacent to one of his merged territories, the territories are merged into an even larger territory. 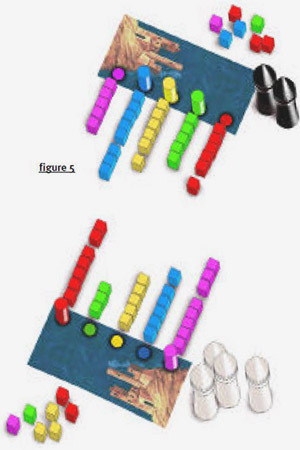 In figure 3, the Emperor has stopped in territory B, which the white player takes over from the black player (it is actually the territory in figure 2 after the takeover). 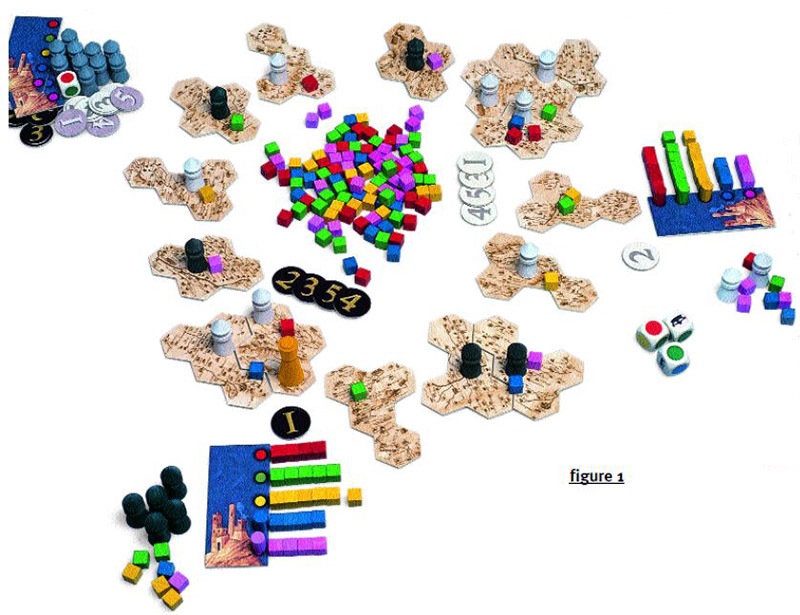 As the white player has castles on A and C, he merges the three territories into one. He may fit them together any way he wants. The new territory contains the 3 old territories, 6 paladins, and 3 castles as shown in figure 4. During the game, players can improve their chances for success by watching their opponent's 7 reserve paladins as they represent his "potential" for his next turn. For example, figure 5 shows the two players' courts and their reserve paladins. Currently, the white player controls red (7 to 6) and pink (8 to 5) while the black player controls blue (8 to 6), yellow (6 to 5) and green (5 to 3). It is the white player's turn. He sees that his control of pink is safe, for the time being, but that the one of red is in danger: the black player has 3 red paladins in his reserve that he could use overtake the white player's 7 reds on his next turn. Fortunately for the white player, he has 2 red paladins in his reserve and can protect his control of red by adding them to his court, giving him a lead of 9 to 6. This would protect his red control, at least for now. The white player also can take over control of yellow from the black player by adding 2 yellow paladins to his court. Which is better? Usually, defense is better. To make counting easier, the players have placed a small gap after each fifth cube. Of course, defense is not always the best answer. Near the end of the game, a player may want to attack his opponent's control to effect a dramatic turnover. Figure 6 shows a portion of the territories in a game corresponding to the courts shown in figure 5. It is still the white player's turn and he is in a poor position! The Emperor is at A. The black player has two large territories at A and C, while the white player has two small territories at B and D. If it were the black player's turn, the game would be practically over. The black player could move the Emperor to B (where he has already the majority, despite the white player's castle), and unite A, B and C in a huge territory topped by 6 black castles. Fortunately for the white player, it is not the black player's turn. The white player played his 3 disc and can move the Emperor 1, 2, or 3 steps. Moving him 1 step would be suicide, so he considers reaching temporary safety by moving the Emperor 3 steps to D. But the white player sees a better choice. The black player has a majority of 9 to 3 at C,but this includes 3 yellow paladins, which is a weakness and the white player has 3 yellow paladins in his reserve. So, he plays 2 of these at his court and gains control of yellow. Then, he plays his 3rd yellow paladin at C and moves the Emperor there. This allows the white player to take over the territory with a majority of 7 to 6 (4 yellow, 2 red and 1 pink vs. 2 green, 1 blue and 3 castles)! He removes the 3 black castles and replaces them with 3 of his white castles, joining B and D to C. From the brink of defeat, the white player has gained control of a large 5 castle territory! 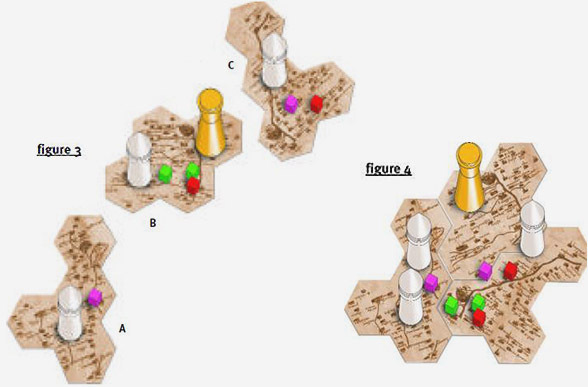 The game ends when a player has 10 castles in play in the territories. That player wins! The game also ends when there are fewer than 4 territories (most of which are probably merged territories)on the table. The winner is the player who has the most castles in play in the territories at that time. Partnership play: if your partner controls a color at his court, do not play paladins of that color at your own court, but consider playing them in the territories. Order of play: this order is even more important in a 4 player game than in the games for 2 and 3 players. In certain situations, playing in succession can be decisive. Sometimes, it is even possible to play 4 times in a row (both playing last in one turn, then first in the next one). Be alert in defending your territories. 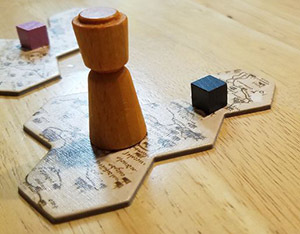 In a 4 player game, territories are relatively easier to take over because of the greater number of paladins that are played in the territories and the chance of players in a partnership playing successively.